100 years ago, in 1912, 3020 cherry trees composed of twelve varieties were given as a gift to the people of the United States from the people of Japan and were planted in East Potomac Park in Washington DC, as well as in Sakura Park in New York. Accidently, when I met with Mr. Tsutomu S. Karino, who is Executive Vice President of the Nippon Club and a long-time supporter of the Japanese Collection in the C.V. Starr East Asian Library, Columbia University, at the Columbia Faculty House for lunch, Mr. Karino informed me that 100 years ago the instrumental person behind this great gift was Dr. Jokichi Takamine who is also the founder of the Nippon Club. Today, these cherry trees planted 100 years ago grow and blossom every year and become not only the famous scene of Washington DC and New York City, but the symbol of the enduring friendship between Japan and the United States. To commemorate the centennial gift, beside many other events, there was a special exhibition: “Sakura: Cherry Blossoms as Living Symbols of Friendship” at the Library of Congress in Washington DC. All this reminds me of the special cherry blossom painting displayed in the reading room of the C. V. Starr East Asian Library at Columbia Library. I saw this painting for the first time when I arrived at the Starr Library for my job interview for the Director’s position in Dec. 2009. 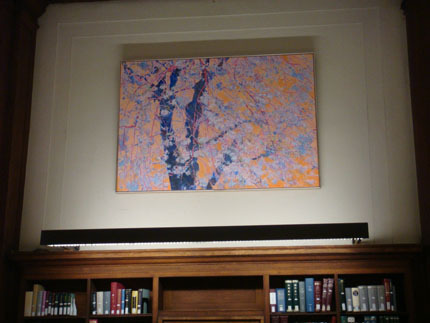 Coming from sunny and warm San Diego to freezing and raining New York City, the bright and shining cherry blossom painting grabbed my attention as soon as I stepped into the Starr library, lightening my spirit and relaxing my anxious nerves. Later, after becoming the new director of the Starr Library I considered the painting to be my lucky star. The cherry blossom painting entitled “Longing (50’ x 72’)” was painted by the internationally known Japanese painter Mizue Sawano in 1998. Ms. Sawano lives in Greenwich Village in New York and specializes in cherry painting. My predecessor Dr. Amy Heinrich was a friend of Ms. Sawano and secured the donation of the painting in 2008, which was installed and admired during a reception attended by the artist, library administrators, and officials from the Consulate General of Japan, friends, and Columbia faculty and staff in 2010. This year, from May 1-30, in celebration of the 100th anniversary of the Japan’s gift of cherry trees to the United States, Ms. Sawano also presented an art exhibit entitled “Eternal Return” with 15 of her oil paintings of cherry blossom at Harvard University. With the heavy classical background of the reading room, cathedral ceiling, chandeliers, wood columns, and stained glass windows, the delightful and flowery oil painting provides a visual contrast and symbolizes the merger of East and West, Classical and Contemporary, Japanese and American. Among the rich collection of Japanese literature at the Starr Library, including several rare titles of Genji Monogatari published around the 14th century, the Barbara Curtis Adachi Bunraku Collection, and the Letters to Prof. Donald Keene from famous contemporary Japanese literary figures, such as Yasunari Kawabata, Kōbō Abe, Yukio Mishima, and Makoto Ōoka, Ms. Sawano’s painting will stay together forever with other Japanese literary, cultural, and artistic treasures and remind the users of the richness and beauty of Japanese art, literature and culture at the Starr Library. In the 21st century, the academic libraries should not only be the house of books and journals, they should also be the social, cultural and artistic spaces for the students and faculty. Libraries should have combined functions of traditional libraries, museums, galleries, and multimedia centers. The cherry painting in our reading room provides us a perfect starting point to that new direction. In pursuit of this vision, we have successfully persuaded another famous, Chinese, artist Xu Bing, who also lived in New York for more than 10 years and now serves as the Vice President of the Chinese Central Academy of the Arts, to donate his characteristic new calligraphic work: “Reflection in reading” to the Starr Library, which will be hung on the opposite wall of Ms. Sawano’s cherry painting. We will continue to acquire contemporary Korean and Tibetan artwork to decorate our reading room. Whenever I see Ms. Sawano’s painting I wonder what the title “Longing” stands for: is she longing for the eternal beauty of cherry blossom? Or longing for the lasting friendship and peace between Japan and the United States and in the world? This entry was posted in Starr Treasures on September 20, 2012 by Ria Koopmans-Debruijn. 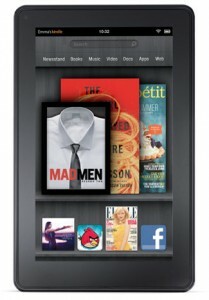 E nter the IM/text a Librarian poster contest and win a Kindle Fire! Design a poster about the Libraries' IM/text a Librarian service! The poster content will also be used as an ad in the Spectator appearing in November! This entry was posted in Announcements on September 14, 2012 by Ria Koopmans-Debruijn. If you missed out on our previous tours, here is your chance to catch up and find out what's what and what's where. Tours start at the library service desk, and last approximately one hour. We look forward to seeing you there. This entry was posted in East Asian Events on September 12, 2012 by Ria Koopmans-Debruijn. These orientation sessions last approximately one hour, and they take place in the Kress seminar room (access via stack level 200). We encourage you to attend one or more of these sessions, particularly if you are new to Columbia. We look forward to greeting you there. Tours of the Library premises will continue through Tuesday September 11, according to the schedule in the previous post. This entry was posted in East Asian Events on September 5, 2012 by Ria Koopmans-Debruijn. 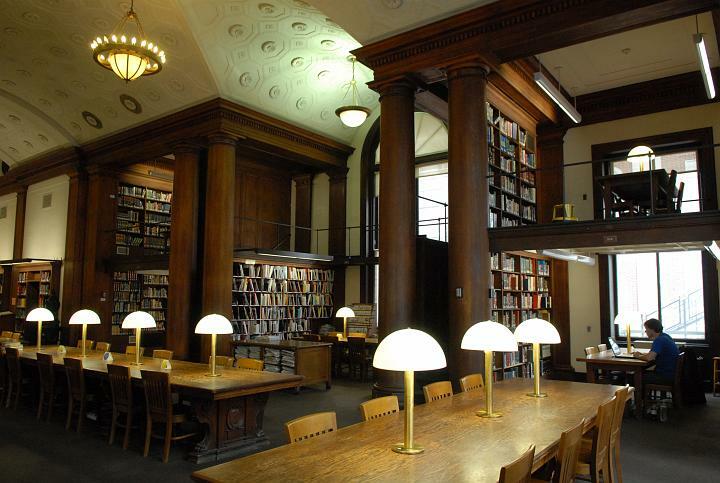 Come and familiarize yourself with all the nooks and crannies of our Library by attending one of our scheduled tours. No sign up is needed. All tours start at the Library service desk and last approximately one hour. Bibliographic Orientation sessions will be offered during the week of September 10. The schedule will follow shortly. This entry was posted in East Asian Events on September 4, 2012 by Ria Koopmans-Debruijn.